Links to Minnesota's pick-your-own farms for everything from apples, berries, fruit, pumpkins, vegetables to cut-you-own xmas trees! Honeycrisp Apples, Haralson, Honeygold, Connell Redand other popular Minnesota apples. 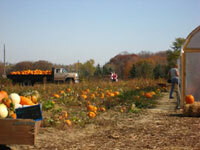 100+ varieties of multi-colored pumpkins, large and small gourds and squashes. Corn shocks, bales, ornamental corn. Red and yellow raspberries, strawberries and tomatoes are still ripening daily. Pick your own at Bauer Berry Farm in Champlin, Minnesota. We are the people who proudly produce your food. We grow strawberries, blueberries and sweet corn for people who like to eat local and safe food. We are a pick-your-own apple orchard. On our farm, we grow 13 varieties of apples on 4000 trees and 5 varieties of wine grapes, on over 3000 individual vines. Some of the apples and all of the grapes are used in winemaking at Parley Lake Winery. Our rustic barn was built in 1888. In the barn, we sell crafts, mums, kitchen ware, books, honey, jam, cider, pumpkins and much much more. Pleasant Valley Orchard offers three acres of mouth-watering strawberries for your picking enjoyment! Picking containers are provided. Families with young children are welcome. Call ahead for picking days and times 651-257-9159. Along with the best strawberries and raspberries that you can pick yourself or have us pick, now you can get a weekly package of fruits and vegetables, all grown at our farm. It's all certified organic. You can pick up your box when it's most convenient for you each week. And you will never miss out on the harvest!